On 30 January new breeding cells were officially opened at Inagro and about 170 stakeholders gathered in Beitum to discover the novelties within the insects sector. The research team focuses primarily on the breeding of insects. 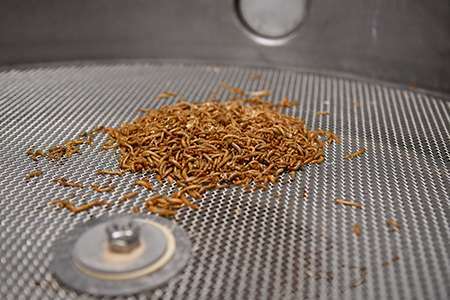 In addition, opportunities are looked at to use insects for animal nutrition and processing of restaurant waste at four insect species: black soldier fly, house crickets, meal worms and Argentine cockroaches. At the opening both domestic and foreign experts were present from the industry to share their insights in different themes. The possibilities with insects are numerous and still growing. The insects are fine waste processors. In addition, they contain high-quality protein, fats and minerals, which can form a sustainable alternative for food for both humans and animals. "We notice that the interest in insects is growing in various sectors", said West-Flemish Council responsible for agriculture and fisheries Bart Naeyaert. The insects are already processed in human nutrition and its recently permitted in aquaculture. Cosmetics companies and other industrial processors use the chitin from insects in all kinds of applications. Read more on our website and see film of the virtual exploration lab.